If you are applying for Testing Accommodations or Administrative Accommodations, you must request this during registration. If you have a request for Administrative Accommodations located on the forms link, you need to complete the required form, but you do not need to complete the long Testing Accommodations application. This must be done at the time of submission to be considered. Once you register for an account, you will be able to log into the system. You will enter your e-mail address and the password you designated at registration. You cannot upload documents until you have submitted your application. Once you submit your application, log back into the User Home and you will see the upload button. 1. 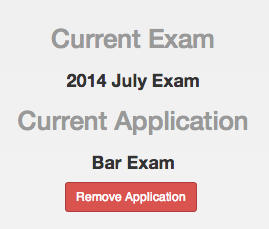 User Home - This is the location where you will complete the application, submit the application, upload documents, and receive notifications from the Bar Examiners Office. This page is very important. It will become your “Home” throughout this process. 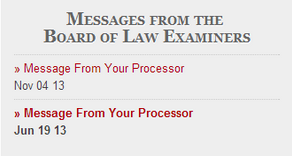 All correspondence regarding Certification of Fitness and the Bar Examination will be communicated via this User Home Page. It is your responsibility to check this page frequently. B. You will NOT be able to submit an application until every answer is complete and every additional form is complete. C. If you answer "Yes" to a question and you see ADD MORE or ADD Form 2.B or ADD Form B-1 or ADD Form B-2 - Civil Court Case/Proceeding Report or ADD Form B-3 or ADD Form B-4 - Other Jurisdiction or ADD Form B-5 / DEBTS: Defaults; Past Due; Revocations etc. you must complete these forms. You MUST complete a form for EACH incident. If you have additional documentation that the question / response requires, you must UPLOAD that information immediately after submitting your application. If you answer yes to a question, and do not complete these forms, you will not be able to submit your application. D. If you take a break while completing your online application and log in at a different time to finish, you can go to "Forms and Progress" on your user "Home Page" and it will tell you what you still have left to complete. If you click Click on ! to view the "Missing Answers" it will give you a list of all unanswered questions and you can jump to the section you would like to complete. This will save you the time of tabbing through each page. For example, when you click "Continue" for the Character and Fitness Questionnaire, it will begin at the very beginning and you will have to click "Save & Continue" to scroll through the application. E. Additional forms that must be printed and uploaded are located under "Forms & Progress" These are forms that must be complete in order for your application to be complete. 1. Dean's Certification - Form C3 - this is a form that will be completed by your Law School. You need to print out this form and take it to your Law School and they will return it to our office. 2. Authorization and Release Form - This form must be completed by you and uploaded into our system immediately after application submission. Your application is NOT complete without this form. It is your responsibility to obtain the original copy in the event we must request an original signed copy. 3. Certified Driving Record - this form is not listed, it is something you will obtain from the States you have held a driver's license with during the past five years. You will upload this record immediately after application submission. Your application is NOT complete without this record. 2. Edit Personal Info - If you made a mistake during registration, or if you are updating your address, or telephone number, this is where you will enter that information. Update the information and then click the update button at the end. You are responsible for keeping your information accurate, and up to date. 3. Start a New Application - Please note that you cannot start a new application while you have one pending. For example, if you decide you want to complete an application for Legal Internship, and you have already begun completing the Bar Exam application, you must wait until your Bar Exam application is complete and submitted before applying for Legal Internship. If you would like delete the application you have started and begin with a new application, you can do that by clicking "Remove Application." 4. View Messages - This is where you will receive messages from the processor that is assigned to your file. This is where you will see a list of the documents that have been uploaded. 5. Remember when you encounter "Technical" problems or have a technical question, you must complete a "Technical Support Request." These questions are not answered by calling our office. They are answered by support personnel. The photo must be high resolution. The photo must have appropriate brightness and contrast. The photo must be taken with uniform lighting and not show shadows. The photo must be taken with uniform lighting and not show flash reflections. The photo must show you looking directly at the camera. The photo must show your eyes open and clearly visible. The photo must show you with no hair across your eyes. The photo must show you with no red eyes. The photo must show you facing square on to the camera. The photo must be taken with a plain light-coloured background. The photo must show you alone. The photo must show your eyes clearly with no flash reflection. The photo must show your eyes clearly with no tinted lenses. The photo must show you with a neutral expression. The photo must show you with the mouth closed. For example: when you might not need to complete the information requested (i.e. not applicable or NA or N/A) would be on the B-1 form (Question 24). It asks for Name of the Provider and then asks for the name of hospital or institution. An applicant may have seen a physician for treatment but was not hospitalized so they would not need to put anything in the hospital section because it is not applicable. In the hospital section, the applicant would simply type NA or N/A.